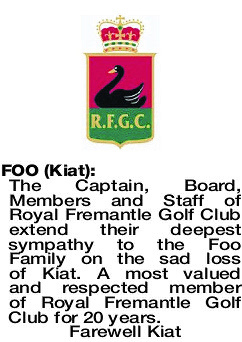 The Captain, Board, Members and Staff of Royal Fremantle Golf Club extend their deepest sympathy to the Foo Family on the sad loss of Kiat. A most valued and respected member of Royal Fremantle Golf Club for 20 years. The Funeral Service for the late Mr Kiat Foo of Booragoon will be held at FREMANTLE Cemetery, Cnr Leach Hwy & Carrington St, Palmyra at the Main Entrance (Samson Pavilion) on THURSDAY (4.4.2019) at 10.00am for a Cremation Service. In lieu of flowers, Memorial Donation to the GI Cancer Institute and Silver Chain Hospice would be appreciated.